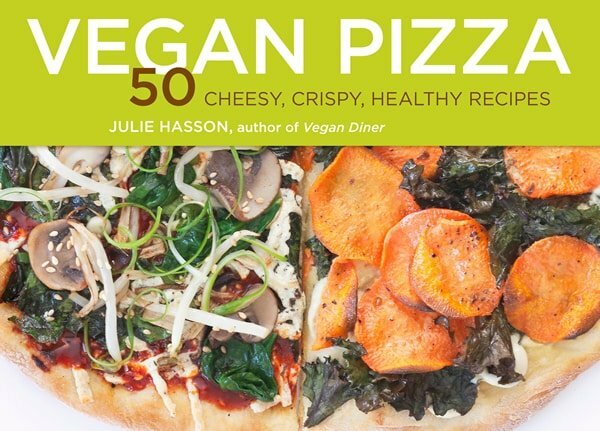 I love Julie Hasson’s new book, Vegan Pizza. In fact I contacted her pr person to get a review copy and since it arrived we’ve been having pizza in our house every week – sometimes even twice. I think you’ll love the recipes she’s letting me share here and make sure to scroll to the end and enter for a chance to win a copy for yourself! Her Easy-Peasy Pizza Dough really lives up to its name. I like to use the variation where you only use 1/2 teaspoon yeast which can take up to 18 hours to rise. I make it before I go to bed and it’s ready to go when I come home from work. You only need to measure out a few things, mix together and cover. Plus, it makes 2 pizza doughs so you can keep the other half of the dough in the fridge for 5 days or pop it in the freezer to keep it longer. 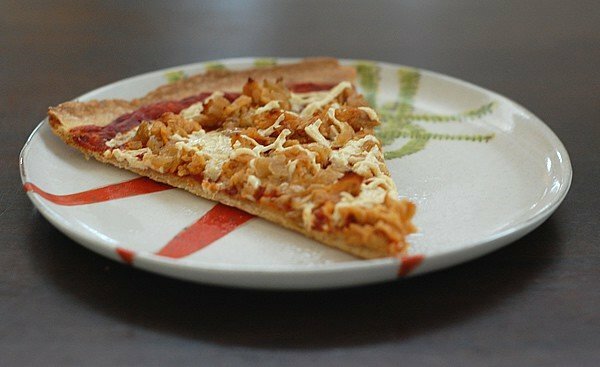 Vegan Pizza has recipes for a white-wheat, spelt, cornmeal and a gluten-free crust too. The basic recipe is after the next picture, but keep scrolling down for a soy curl topping and a special flavor pizza too. In a large bowl or a food-safe 4-quart plastic Cambro bucket, combine the flour and salt, mixing well with a fork. Cover the bowl or bucket with plastic wrap or a fitted lid, and set aside in a warm place to rise for 2 to 3 hours (or up to 6 hours). At this point, you can also refrigerate it, covered, for up to 5 days, or divide the dough into 2 or 4 pieces and freeze them in a sealed zip-top bag (with room for dough expansion) for up to 2 weeks. Thaw the frozen dough overnight in the refrigerator before shaping. Shape and bake the pizza according to the recipe directions. Variation: For even more flavorful dough, reduce the yeast to ½ teaspoon, and let rise for about 18 hours before using or refrigerating to use at a later time. She gives us a few homemade cheese spreads and sauces to use in case you aren’t a store-bought vegan cheese fan. I love my Daiya on my pizza, but Julie has something for all of us! Then there are the awesome diy toppings like sausage crumbles and the awesome Sweet and Smoky Soy Curls that are my favorite. Sometimes you want just a little sweet and smoky flavor to play off the other flavors on your pizza. Well, this is it, and these Soy Curls are so good, you’ll find yourself using them every chance you get. Leftover Sweet and Smoky Soy Curls will keep for several days, so you can make a batch ahead of time, and toss them on a pizza when the mood strikes. They are also lovely tossed in a salad, tucked into a sandwich, or just eaten out of hand. In a small bowl, combine the Soy Curls and boiling water. Let stand until softened, about 10 minutes. Drain the Soy Curls, pressing out as much water as possible. You want them very dry. 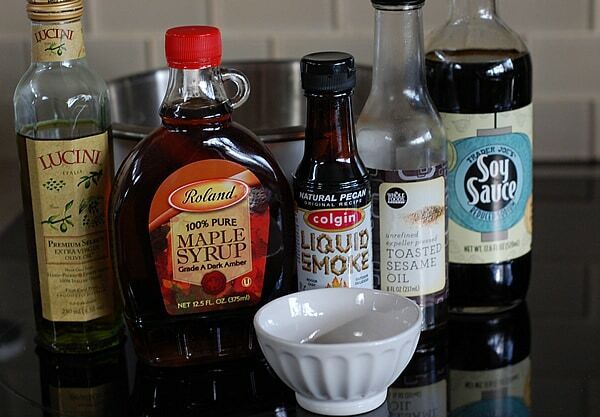 Toss the Soy Curls with the tamari, liquid smoke, maple syrup, nutritional yeast flakes, sesame oil, and salt. Heat a large cast-iron skillet with 1 tablespoon of olive oil. 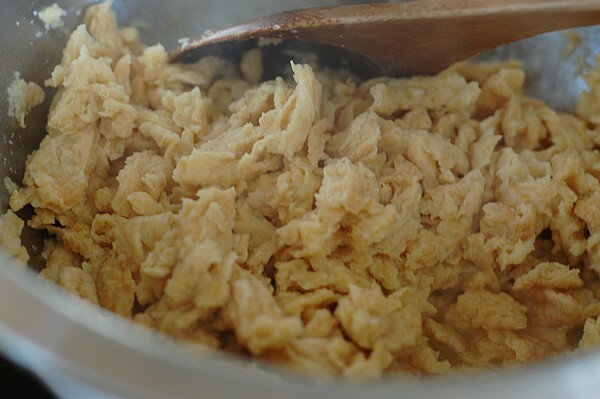 Add the Soy Curls and cook, stirring often, until they are nicely browned, 10 to 15 minutes. The Soy Curls should have a nice chewy texture at this point. If necessary, drizzle in a little more olive oil as needed. The Soy Curls are now ready to use on your pizza. Alternatively, let the cooked Soy Curls cool, and refrigerate until ready to use. In addition to the dough, cheese and topping recipes Julie puts together some very creative pizza combos to try like bibimbap, taco and this lovely cowboy pizza. Preheat the oven, preferably with a pizza stone inside, to 500°F for 30 minutes, while getting the pizza ready. Divide your dough into 2 even pieces. Keep 1, and return 1 to the bucket, cover, and refrigerate for later use. On a lightly floured surface, stretch or roll out your dough into 1 large or 2 small rounds, as thin as you can get it. I like to make my small pizzas about 11 inches and my large between 14 and 15 inches. Don’t worry if your dough tears. Simply patch it back together with your fingers. Lightly dust with additional flour if the dough is too sticky. Try not to use too much, or your crust will be very dry. Carefully transfer the rolled-out dough to a large sheet of parchment paper. Spread the barbecue sauce (about ¼ cup for each small pizza, and about ½ cup for a large) evenly on the pizza, leaving a ¼- to ½-inch border around the edge. Sprinkle the cheese over the sauce, and top with the Soy Curls. Sprinkle the broccoli and jalapeños, if using, over the Soy Curls. If making 2 small pizzas, repeat with the remaining pizza. Carefully transfer the pizza and parchment paper to the pizza stone, if using. Otherwise, place the pizza on a baking sheet, and place in the preheated oven. If making 2 small pizzas, repeat with the remaining pizza. 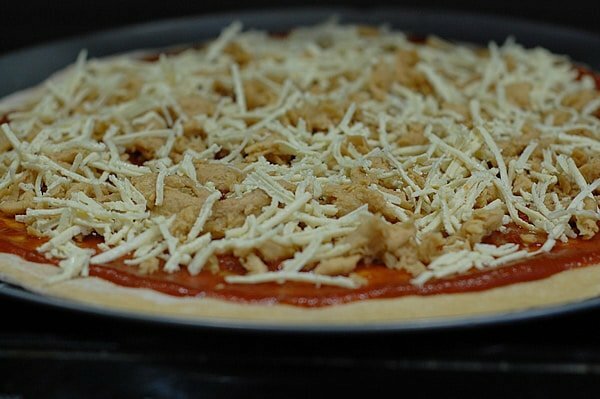 Bake for 10 to 15 minutes, until the cheese is melted and the crust looks fairly darkish brown. If it’s not done, continue baking for a few more minutes. Let the pizza cool for 5 minutes. Sprinkle the chopped cilantro on top, cut into slices, and serve right away. The Sweet And Smoky Soy Curls can be left off, if desired. I love mushrooms, bell peppers, black olives, and arugula! I love the vegan pepperoni from vegan on the cheap, but my all time fav is mushrooms!!! These all sound delicious! I love spinach on my pizza. 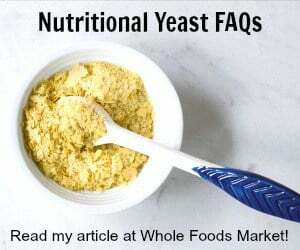 If it’s cheeseless, I like to add nutritional yeast. Cashew ricotta, caramelized onion, spinach, and toasted walnuts. Now I want pizza! I love tons and tons of caramelized onions and mushrooms.. as well as zucchini! Basically loads of any kinds of veggies are awesome! Looks good, can’t wait to make up a couple! I think I’ll go with mushroom and onion. Yum! Pineapple! Green bell peppers is pretty high on the list, too. Also potatoes and green onion. Can’t believe I forgot about those!! My favorite pizza topping is artichoke hearts. Give me a pizza with artichoke hearts, and I’m all over it! What a great post! I already was wanting a copy of this book, and your review put it right at the top of my holiday wish list! Probably roasted garlic. Or if you can eat it really quickly after it’s made, avocado is amazing, but in my experience it goes funky pretty fast. My favorite pizza topping is mushrooms. I love avocado on my pizza and mushrooms! I love pineapple, pesto, olives, and roasted potatoes. Mmmm. Would love to try the recipe for gluten-free crust sometime! I like roasted garlic, artichoke hearts, mushrooms and olives on my pizza. Thanks for the chance to win this book and expand my pizza horizons! I love trying different pizzas at home! Makes a fun dinner. My most recent was caramelized onions, buffalo tofu and peppers. So delicious! red peppers, mushrooms, and onions! I love olives on my pizza.